Hola! Great win for Roger as he cruised past Fernando “Fiasco” Verdasco in straight sets in yet another routine match. I predicted straight sets and Fed got the job done winning 6-3, 6-4, 6-4. Yet again Roger recorded some great stats en route to his victory; hitting 30 winners, making 67% of first serves and winning 26 of 27 of points at the net. The match started fairly evenly with Verdasco serving well and holding comfortably. Roger was as always solid on serve and as usual once the set got near the business end he broke to lead 5-3 before serving it out easily. Verdasco actually played pretty well in the early stages but he has a habit of struggling under the tiniest amount of pressure and whilst Roger upped his game when it mattered, Verdasco made a few too many errors and not enough first serves to drop the set. To even make the match remotely competitive Verdasco had to win the first set and when he failed to do that you just knew it was going to be plain sailing for Roger. Verdasco isn't really a threat when he's behind as his head drops and he loses belief. This was easy for Fed to sense too and he started to play freely and moved into the net way more often. Usually Roger only ever comes in behind very solid approach shots but against Fiasco he was moving in behind a range of shots which was interesting to see. It's higher risk and means he'll get burned a few times but the rewards are high if he can make the volley. Luckily Verdasco didn't really come up with many good passes and the windy conditions made it difficult. Roger broke Verdasco's serve in the opening game of the second set and that was game over. There was a little period at the end of the set where Verdasco starting red lining his forehand a bit more but once Roger zoned in on his own forehand he was able to stave off any danger as he took the set 6-4. The third set followed a similar pattern and Roger broke to lead 3-1 and from there on it was just a matter of taking care of his own service games. Verdasco hit a few big forehands but it was never going to be enough to find a way back into it and Roger sealed it with an immense acute angled backhand volley. I had no clue my stats were that good coming in,” said Federer. “I really tried to play offensive against Bjorn Phau in my second match. I did lose more points than I was hoping to. I think that gave me the confidence to move forward today and conditions helped that because it was quicker during the day. Yet again this was another great display from Roger, he's not been tested yet mainly because the opposition hasn't been great but I think the way he's playing is very pleasing. He's playing smart tennis, moving well and he's able to dictate how a lot of the rallies pan out. When Verdasco is on form he can mix it with the best but since his breakthrough in 2009 where he made the semi finals of the Australian Open he's not made any progress. I'm not sure if he's lazy or just doesn't care but his game hasn't developed and in many cases it looks like he's taken a retrograde step. His forehand doesn't look as potent as it once did and his second serve is a real weakness. There were a couple of points where he ran round his backhand and fired big forehand winners but they were few and far between to make any sort of impact other than an applause from the crowd. In terms of Fed's game it's just improving as the tournament goes on and he's looking fresh. He's spent little time on court in the humid New York conditions and hasn't played any sort of physical match which is really good news. He said in his presser he has a bit of a blocked nose due to all the air conditioning they use in New York but he's feeling good so I'm confident he can make at least the semi finals. Roger will now meet Mardy Fish after he beat Gilles Simon in 4 sets in a match that ran until about 1am New York time. Apparently both men were struggling physically with Simon playing a 5 setter and a 4 setter in his first 2 matches and Fish also going 5 against Davydenko. I haven't seen anything of the match other than a 2 minute highlight clip and both men looked tired. By the fifth set Simon was running on fumes and Fish was able to take advantage with his attacking style. Fish committed a crazy 75 unforced errors and if he does that against Roger he's gonna lose quite heavily. It's a pity Simon always plays 5 set matches and doesn't have a good serve as he's probably one of the most natural ball strikers on tour. He can find winners from miles behind the baseline and is very good at finding angles on the pass. 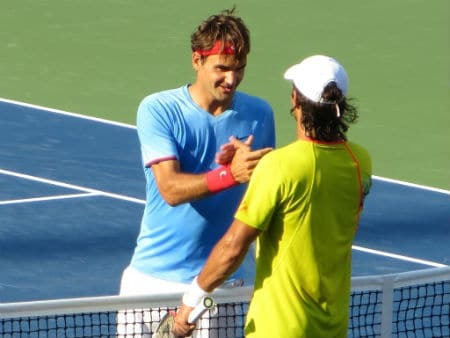 I'm glad Fish went through to be honest as Simon can cause Fed problems and I think the outcome of Fed/Fish at the US Open was determined with Roger's win in Cincinnati. Fish played well that day and still lost in straights, 3 sets is his best chance and this time it's over 5, in a Grand Slam and he's spent quite a long time on court so I think Roger is getting it done in straights again. Even if Fish wins a set I figure Roger is going to have too much in the tank for Mardy so there's only one outcome. Allez les suisse! I can see Fish giving Roger one tough set but that’s it. He struggled badly against Simon and it’s already an uphill battle for him on the best days, and now, it looks like Fed will be gearing up into fine 2nd week form. Were Simon and Fish doing baseline drills the other day? No oomph on the shots, no commitment, they were both sleep walking. If Fish stays that passive against Rog, well……need I say more? Yeah weird match errors wise. Simon had a shoulder injury and I guess we know now Fish wasn’t feeling good physically. If Roger backs off slightly, Fish may take a set, but thats all he can probably get. Murray should of lost to Lopez, stats show Lopez actually won 8 more points in total than Murray, doesn’t make sense at all, especially in the close three tiebreakers. When Roger lost to Nadal at Aus 09, he had actually won 1 more point than Nadal. That made enough sense as he didn’t convert any his BPs in the third set. Yeah, crazy. Blowpez should have taken that to 5 at a bare minimum. He’s terrible on important points. I was tweeting about that overhead he missed in Rome against Fed at 5-2 in final set breaker. Hilarious. Blowpez! LOL. Fed got a nice break and should be fresh for Birdshit. Looking foward to the Wolfman/Raonic match. By the way, Serena Williams was so pi**** Fish gave Roger a walkover that she walked over her opponent 🙂 Fair game? Serena looks unstoppable, only way Sharapova will beat her is if Serena has an off day. I think Fish’s health problem is more serious than we all realize. I think he will anounce his retirement within this season. I have to say, I was highly disappointed with Raonic’s performance against Murray. I didn’t see the match because it was during my first three periods at school but during my lunch break I checked the result at the library. Looks like he didn’t put any effort at all. I just saw the highlights a couple of days back, he was poor!